No one wants to see roaches loitering in their home. However, they are hard to get rid of because some species fly and crawl in the ceiling and walls. That’s where pest control services come in. They can help you exterminate annoying cockroaches, but it is a costly approach. Besides, pest control services use chemicals that leave a harmful residue to get the job done. How to get rid of roaches fast without an exterminator? 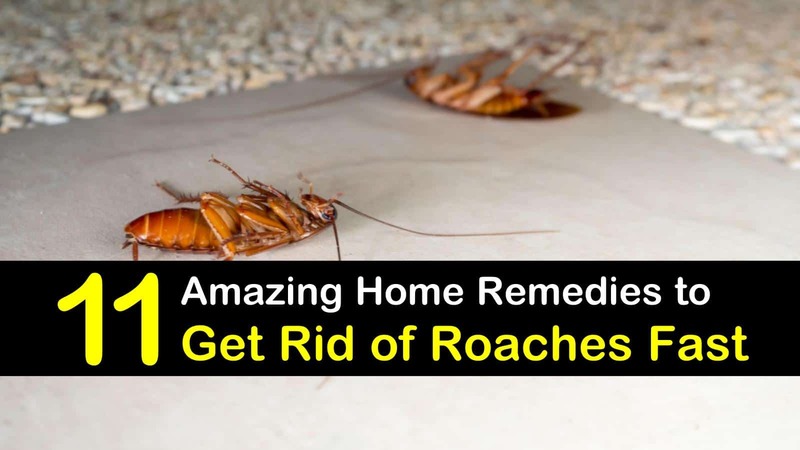 Make home remedies to get rid of roaches fast and more affordable. What are the Most Common Types of Cockroaches? Why Use Home Remedies for Killing Roaches? Although not necessary, we recommend knowing basic information about cockroaches. Being able to identify them correctly will assist in choosing the best home remedy to kill roaches. Why? Some roaches breed indoors while others make their nests outside and may occasionally crawl their way through various entry points in the house. Knowing their activity pattern and nesting habits will help you recognize what home remedies for killing roaches are most effective and how and when to proceed with the extermination process. The most common roaches are American cockroaches, German roaches, and oriental cockroaches. American roaches are reddish and may look greyish when they are young. Cockroaches stay and nest mostly outdoors such as in areas where garbage piles up or in between sewer lines. Roaches usually invade houses to steal food in warm seasons and seek shelter during cold months. Like American roaches, oriental types tend to stay outdoors and visit household mostly during cold seasons. Roaches often remain under kitchen sinks and near water sources like bathroom cabinets and sewer lines. If you have a broken water pipe, then there is a higher chance of harboring oriental cockroaches. This species has a distinctive dark-brown to shiny black body color. German cockroaches look brown and are distinguished by their two black stripes just below their head. They rapidly multiply which is why we suggest more potent DIY killer recipes if you suspect a German cockroach infestation (..). Here, we have listed eleven solutions using household ingredients for natural remedies and roach traps. Coffee is naturally acidic by nature. This acidity acts as a poisonous substance against roaches and due to its potent smell, coffee grounds can repel roaches naturally. Pour some coffee ground into a small container. Do not put the lid and place it on areas where roaches frequent. If you are still looking for ways on how to get rid of German roaches fast, use Borax. Borax, also known as boric acid, is a powdery white mineral base of a powerful homemade roach killer that can keep cockroaches away. It works by attacking the roaches’ nervous system and drying out their bodies. Make your DIY roach trap with Borax and sugar. You can sprinkle the mixture on high places where kids or pets can’t reach. We recommend putting it in a bowl to make sure that it won’t get scattered by air. Some excellent places to apply Borax are on top of tall cabinets, under the sink, and on dark and damp areas in the house. This DIY recipe works because roaches are attracted to the sugar. Once they consume this cockroach bait, they will die instantly. Dispose of dead bugs appropriately. If you do not have boric acid powder at home, you can use DE or diatomaceous earth. This one of many incredible great uses for diatomaceous earth. DE is a safe and natural pest control method that can kill any indoor nuisance such as German cockroaches and other creepy crawlies. If you are looking for organic ways on how to get rid of german roaches naturally, you can try this diatomaceous earth recipe. Mix all ingredients in the spray bottle and shake well. Spritz the solution in areas where you suspect you have a roach problem. Sticky traps will help you monitor the most common locations as well as the population of roaches in the house. Paint an old bottle with any dark color paint to use as a jar trap. Place the food inside the darkened jar. Using your hand, spread some petroleum jelly on the inside of the jar. If you don’t prefer to touch the petroleum jelly, you can wear disposable gloves. After applying the petroleum jelly, place your trap in places that you think roaches appear. Put it near possible entry points, near water sources or food sources, as well as inside kitchen cabinets. Do moth balls repel roaches? The answer is yes. Like moths, cockroaches hate the smell of mothballs. So, if you have plenty of those, you can strategically use them in roach infested areas of the house to solve your cockroach infestation problem. Lemon juice is an effective roach repeller. Because of its strong citrus smell, certain species of roaches avoid lemon scent. If you want to try all natural ways of repelling cockroaches, this may help. Pour and mix lemon juice and water into the spray bottle. Shake well and spray on areas such as the back of furniture or appliances, trash bins, crevices, cracks, and underneath baseboards. Many people say that crushed bay leaves scare roaches due to the smell. So, if you have a couple of bay leaves inside your kitchen cabinet, grind some and sprinkle in discreet corners or possible roach entry points. Check now and then and replace if necessary. Another crowd-favorite natural roach killer is cucumber peels. Like bay leaves, some folks claim that cucumber’s scent ward off insects and bugs such as American cockroaches. However, while they can be used as cockroach control, you still need a different method to kill them. Baking soda is a safer alternative to Borax or diatomaceous earth. Aside from evicting cockroaches of the oriental type, baking soda can also get rid of other household pests. Mix the baking soda with the sugar and place it in a disposable bowl or pot. Use it as bait instead of buying commercial gel baits for roaches. Please note, however, that this recipe does not kill roaches, it only works like a trap. Many people believe that fabric softener dryer sheets can repel roaches. However, for this method to be effective, a large number of dryer sheets are needed to cover the entire house. So, instead of placing dryer sheets in various areas of the house, we recommend concocting a fabric softener spray. Make your spray by mixing water with fabric softener. Shake well and spray on cockroach hotspots such as under the sink, trash bins, and drains. Aside from cleaning the dirty dishes in the sink, dish soap can eliminate roaches in the same way that soapy water can kill bugs. How? The soapy water creates a thin film that hinders bugs and cockroaches from breathing correctly. If you see a roach crawling in the house, spray with this recipe. Mix the dish soap and water in the spray bottle. Shake it well and spritz the solution on creepy crawlies in the house. Keep in mind, however, that it won’t instantly solve your problem with roach infestation because roaches lay eggs and multiply in various areas of the house. While commercial cockroach repellent and killer products such as insect growth regulators might eradicate roaches, they usually cause more health hazards than benefits. They present some significant health issues for people, especially in children. So before you grab some store-bought products to repel roaches, stop to think that albeit it is a quick fix, it is an unsafe pest control method. 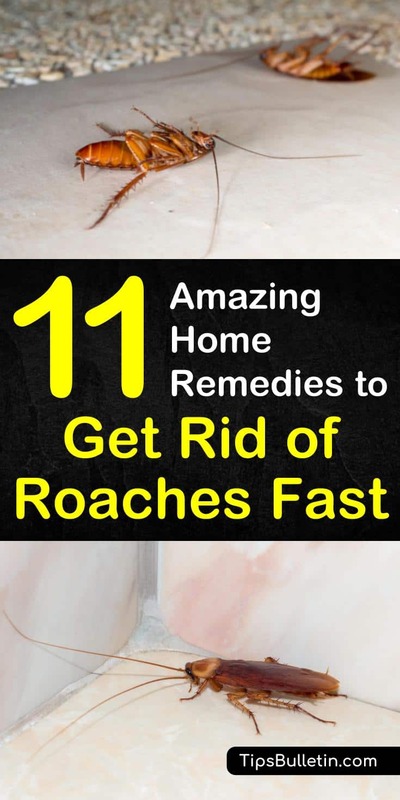 We hope you found our list of the best home remedies to kill roaches helpful. Please share these tips to get rid of roaches fast. Impress your friends on Facebook and Pinterest by telling them these amazing roach killer recipes!